Waiting for the sun to bring warmth after the frosty night on the Moine Mhor a few days ago (see my last post - April Igloo) I thought, as I often do, about how much I enjoy wild camping. I've written about this quite often as it's one of my favourite subjects. Here's a piece from several years ago, with an ending that applies accurately to this weeks trip. The finest roof when camping is the open sky. Falling asleep watching the stars and the ragged silhouette of mountains etched against the sky then waking as the first pale light glows in the east and the sun rises, bringing colour and light back to the world, is the most thrilling way to spend a night in the wilds. In dry areas such nights can be the norm. 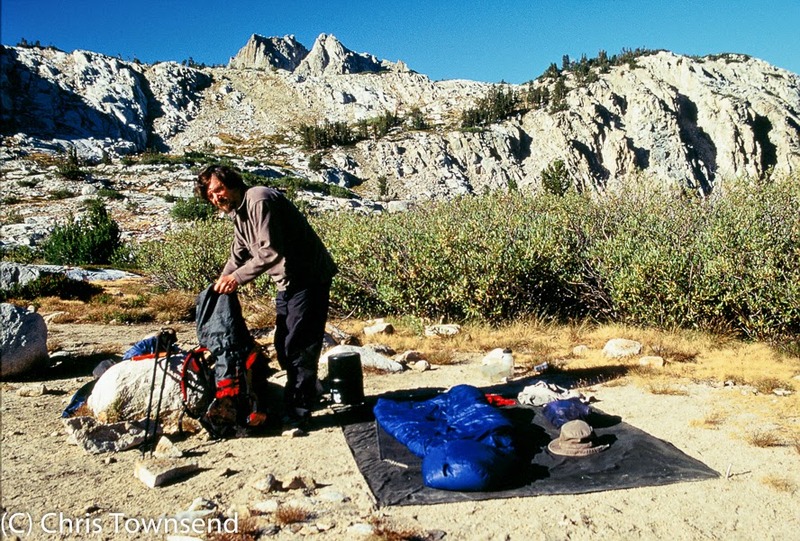 During both my two month long Arizona Trail walk and a five week hike in the High Sierra I spent more nights under the stars than in a shelter. Sleeping out like this means keeping in touch with nature, in touch with the world. Breezes ripple the sleeping bag and brush your face; the sounds of animals scurrying nearby are loud and clear. If you stir and, half-awake, open your eyes you see stars, trees, rocks, grass and the whole spreading natural world rather than nylon. And when you wake at dawn you are already outdoors with no need to unzip the tent to see what’s happening. Of course there are nights when the wind blows too hard or the rain starts to fall or, worst of all, biting insects launch an attack. Then you need a shelter. Even those scurrying animals can force you under cover. One night in the Grand Canyon mice running over my sleeping bag kept disturbing my sleep until, in the early hours of the morning, I pitched my tent and sealed myself inside. After the open sky the next best shelter is a roomy tarp pitched so you can see out all around, followed by a tent with doors that open wide, again providing a good view and some contact with the outside world. 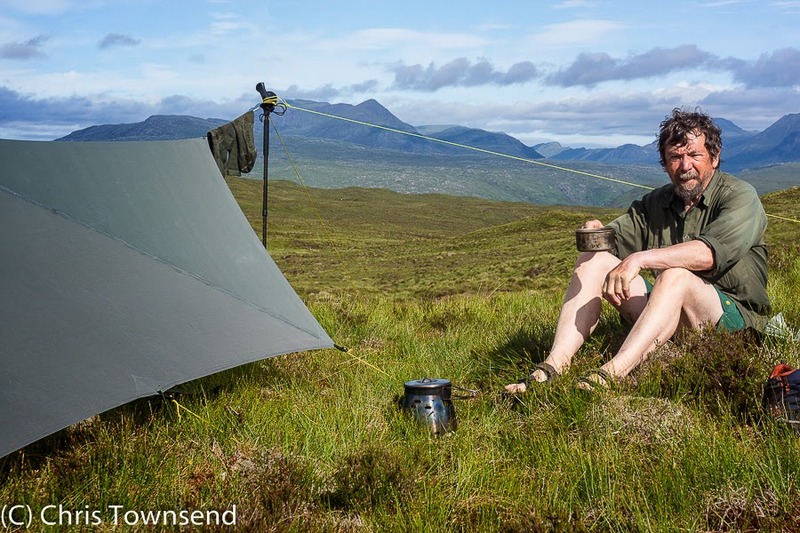 Only when high winds blow and heavy rain or snow falls or the midges are biting do I close up a tent. I don’t go outside to be inside. Sometimes, though, stormy nights can be pleasurable. Lying in a warm sleeping bag listening to the rain rattling on the flysheet and the wind roaring past in great gusts can be strangely relaxing. Feeling snug and secure inside a tiny shelter is satisfying. But few such camps are really unforgettable; the lack of contact with the outside reduces them to simple enjoyment in being able to survive happily in a storm, with nothing distinctive to remember them by. Sometimes, though, camps in poor weather can become surprisingly memorable. Having spent a long frustrating day zigzagging through dense forest in rain on my walk through the Yukon Territory I was faced with a dismal camp in a dark, viewless, dripping spruce forest. Here the presence of bears turned what would have been a forgettable night sealed in the tent into a special, magical one. Because the bears that live in this vast wilderness might be attracted by the smell of human food it’s wise not to sleep where you cook, eat or store food so I slung a small tarp I’d brought as a cooking shelter between two trees. The place was still cheerless and dull so to make it friendlier I lit a small fire in front of the tarp. Instantly the atmosphere changed. Shadows danced and flickered around the flames. The black trunks of the trees were now walls, protecting my little bright and warm space. The falling rain sparkled in the firelight. I felt content instead of fed-up and stared into the fire for long hours, reluctant to leave it for my tent and sleeping bag. More usually wild camps are remembered because of a combination of a beautiful or spectacular situation and weather that don’t force you into a closed tent. Camps where the tarp or tent is just a bedroom are ideal. After that I like ones where I can look out from my shelter, protected from wind and rain but not cut off from the outside. Whilst sleeping under the stars is not possible that often in Britain (and by sleeping under the stars I mean just in a sleeping bag with the hood open, not sealed in a bivi bag, which I find more confining than a tent) camps where you can sit outside or look out from your shelter occur surprisingly frequently when camping in the British hills, especially outside of summer. The last may seem surprising but the one horror that can force me inside a tent with the doors shut tight are the ravenous hordes of midges that roam the hills searching for campers in the summer months. Midges are usually associated with the Highlands but I have memories I wish I could forget of midge-ridden nights in the Lake District too. 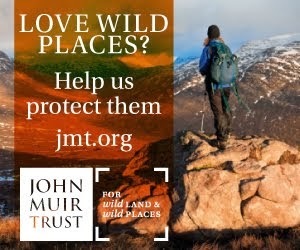 Outside of midge season wild camping in the British hills can be a delight. The number of possible sites is legion. I discover new ones every year and the list of ones I’ve passed by but intend returning to would last several lifetimes. 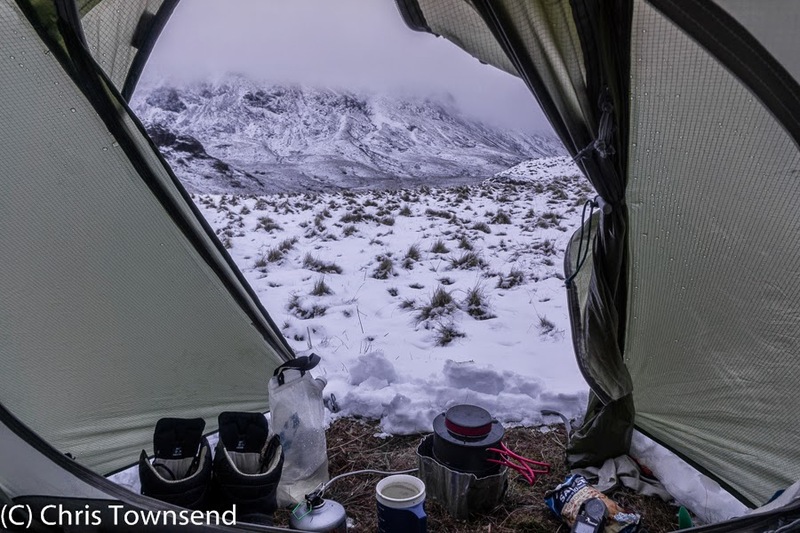 Morning after a night of wind, rain and snow in the Lake District this February - sometimes a tent is welcome. Taking pleasure in camping means that I rarely walk from dawn until dusk as this allows no time to enjoy a camp site. 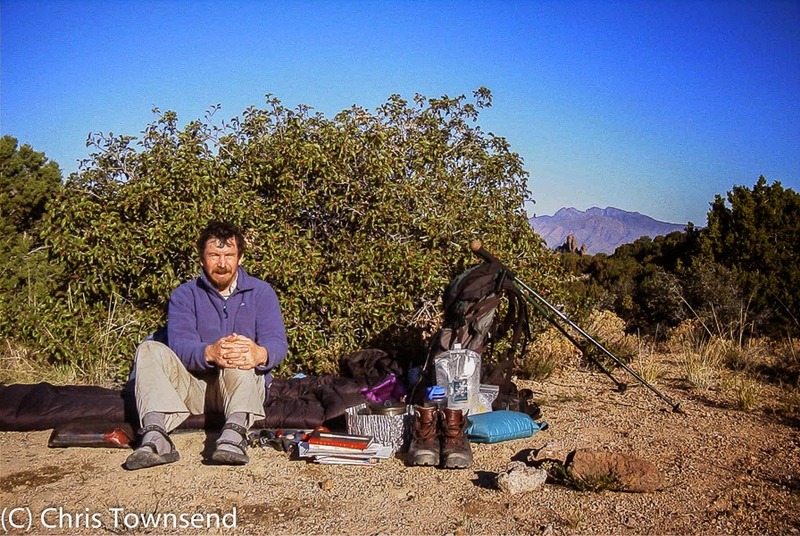 For me contemplation and slowly absorbing my surroundings are an important part of backpacking. Staying in one place gives the opportunity to notice the little details, the subtleties of the land, that are easily missed while walking. 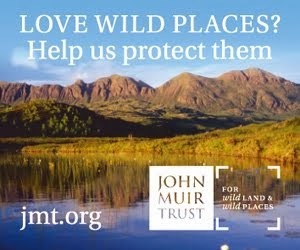 Wildlife is more likely to be observed from a camp too, another reason not to be closed away from the outside. 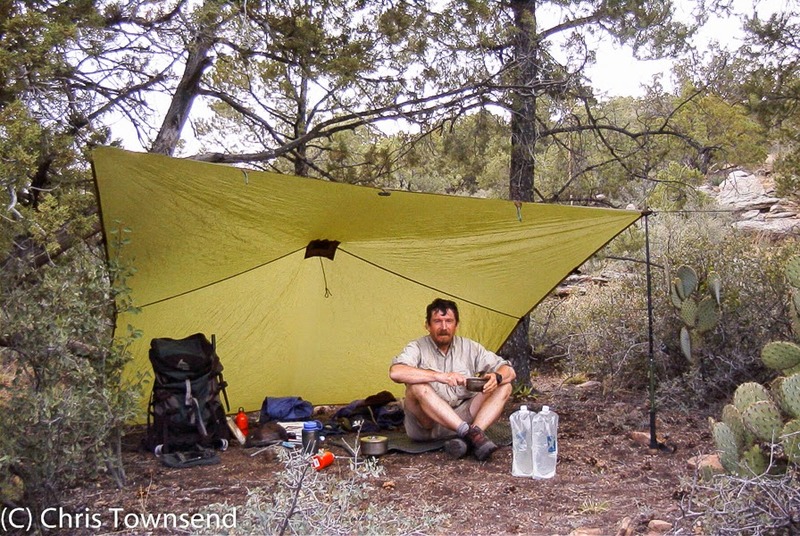 Tents and tarps make good hides. 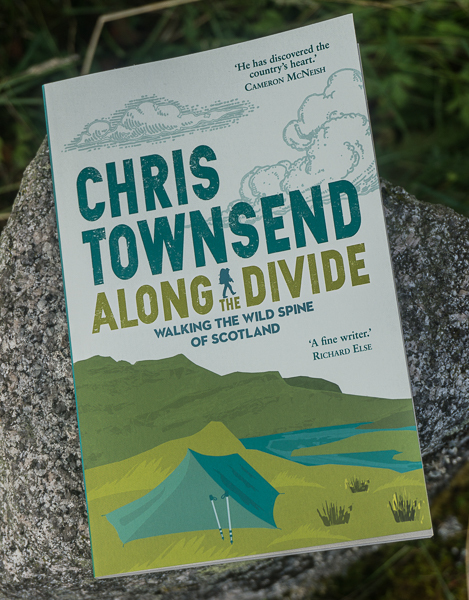 On one TGO Challenge I camped on the edge of a small pine wood and woke at dawn to the strange bubbling calls of black grouse at a lek. Lying in the tent I watched these magnificent birds strutting and preening and fanning their wide tails as they competed for mates, a wonderful way to start the day. On other walks in other places I have been woken by a moose splashing high-legged through a shallow lake, deer grazing in a meadow just feet from the tent and porcupines shuffling through the grass. Having time in camp means being able to watch how the passage of the sun and the fading and strengthening of the light changes the landscape, altering how it looks and how it feels. In the evening the shadows grow and colours fade, hills turn dark and lose detail, sunset turns clouds pink and orange before the sky blackens and the first stars appear. The world becomes mysterious and hidden. Then at dawn the darkness fades as the still hidden sun lightens the sky. The flat black featureless hills start to change, revealing shape and detail as ridges, cliffs and gullies appear. The first sharp rays of the sun touch a hill top, turning it red and gold. Slowly the sunshine creeps down the mountainside and across the land, approaching camp and bringing the promise of warmth and life. Just a few days before writing this I lay in my sleeping bag on a frosty morning in the Highlands watching the sun turning the white, shivering land a warm, sumptuous golden brown. Gradually, oh so gradually, the sunshine slipped towards my frosted tent. I relished the anticipation of its warmth then revelled in the sudden heat and light. I never tire of those moments, the return of light and life to the world. They alone make wild camping an incomparable joy. I really enjoyed this article and the photos Chris. Thank You. I like how you "Define camp" and so enjoy it. It's a part of the journey - not some inconvenient point, disrupting your progress forward, but simple joy, relaxing and being there in that moment outdoors. A fine read Chris and points I agree with. Thank you for sharing that. Really enjoyed this post. I only discovered wild camping a few years ago and it has given me so much in the way of happiness. Can't be beaten. A beautiful read, Chris. It echoes many of my (much fewer) experiences. I particularly remember a fantastic cowboy camp in Sherwood Forest a few years ago, although I like the warm security (against what?) of a tent, too. I love making and being in camp, and spending time observing. It's all part of my experience, but I appreciate others may get their rewards in a different, faster, fashion. It is nice to read when others enjoy something similar, too, though. Great stuff Chris. You are right on for every point. I sleep best when I am laying on a tarp under the open sky. Inside the tent is only needed when it's too we or buggy outside. I am looking forward to reading more of your content. Now that I found your blog I will try and keep up with it. Very inspiring stuff. Thanks. i really like this post, thanks for sharing !